The All Events and Team gold medallist picked up her third gold medal of the championships with a victory over second-seed and challenger, Grace Gella of Philippines A, 430-385 over a two-game total pinfalls all-lefty Girl's Masters final. Quek took the first match, 224-175 for a 49 pins advantage going into the second match. Although the Filipino fought back winning the second match, 210-206, the gap Quek had from the first match was enough to seal the victory. Gella, who added a second medal for Philippines A with the silver, had earlier edged third-seed, Jamie Phelan of Australia A, 212-205 to face the Singaporean. Phelan, who won the bronze medal in the All Events, added a second bronze from the Masters. The champion led from start to finish in the earlier second block Round-Robin finals with 1564 including three wins and a 16-match grand total of 3473 to advance to the stepladder finals as topseed. Gella finished second with 3366, adding 1612 and five wins in the second block. Phelan secured third position with 3346 from a 1612 total and five wins in the second block to make the cut for the stepladder finals. Akari Yasuda, who was third in the first block, missed the cut by 34 pins after finishing fourth with 3312 while Amy Shoesmith of Australia B rounded out the top five with 3277 total. 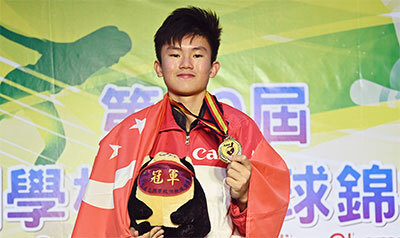 In the boy's division, Eugene Yeo earned a crack at the title after he dispatched third-seed, Ivan Tse of Hong Kong A, 221-208 in the semi-final match. In a yet another all-lefty final, Yeo beat topseed, Hokuto Fujinaga of Japan, 206-189 in the first match for a 17 pins advantage. Despite losing 215-227 in the second match to the Japanese, Yeo clinched the gold medal with a 421-416 victory in the two-game total pinfall tie. Fujinaga concluded the earlier second block Round-Robin finals with 3667 to advance to the stepladder finals as topseed. Yeo earned second position with 3621 total while Tse, who was fourth prior to the position round match, beat Sho Saito of Japan, 245-225 to clinch the third and final stepladder spot with 3618. Despite not winning the gold medal, Japan emerged as Boys champion with 2 gold and 2 silver medals. 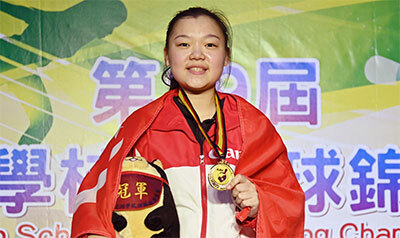 Singapore A's only gold medal from the the Singles event won by Shin Zong Yi was enough to emerge as Girls champion. The overall champion title went to Japan with 2 gold, 2 silver and 1 bronze medal. Singapore A finished second with 2 gold, 1 silver and 3 bronze medals. Hong Kong A was third with 2 gold, 1 silver and 1 bronze medal. 56 boys and 40 girls from eight countries participated in Singles, Doubles and Team of 4. The top 16 boys and top 16 girls with the highest pinfalls from the three events qualified for the Round-Robin Matchplay Masters finals in which the top 3 boys and top 3 girls with the highest pinfalls advanced to the stepladder shootout finals. The week-long championships was hosted by Chinese Taipei Bowling Association and fully sponsored by Taichung City Government was held at 20-lane Da Chung Bowling Centre.